New Models open at Lighthouse Cove at Waterside! Team Cashi attended a luncheon this afternoon hosted by Homes by Towne at Lakehouse Cove in one of Lakewood Ranch’s hottest new communities of Waterside. The luncheon was provided to unveil the latest set of models being built by Homes by Towne, titled the Clipper Series, these homes base prices are starting at $408,900 for 1888 SF and will go up to $462,900 for 2500 SF. Don’t forget you will need to add a lot on to these prices and those will be ranging anywhere from $2500 for a standard lot to $30,000 for a lot with more of a water or preserve view. There are several inventory-already built-homes available which bundles the price of the house, the lot and many of the most sought after upgrades that people are likely to choose in today’s market. These are priced between $444,300 and $497,700, just in case you don’t want to or cannot wait to build, one of these inventory homes may be a great option. Speaking of which, Homes by Towne is telling us that buyers should allow for 10-11 months from the day they sign the contract to the day the moving van is pulling up to the house. LOCATION: The location of Lighthouse Cove at Waterside is amazing, just West of Lorraine Road and South of University Parkway in Sarasota County. It is situated on Kingfisher Lake which is the same lake that Waterside Park will be built on. Groundbreaking is very close for this new shopping/dining waterfront mecca that will be reachable via water taxis from Lighthouse Cove. 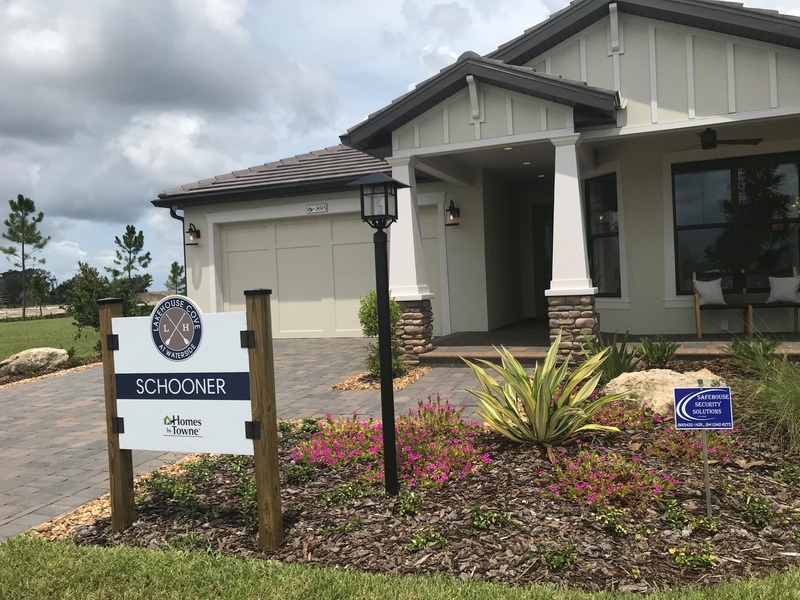 Tami & Lori Cashi are very familiar with the new construction being offered in Waterside, along with all the other new hotspots of building in Lakewood Ranch. Did you know there are currently 22 builders constructing new homes from SR64-University Parkway? They would love to tell you a little bit about them all or set up an appointment to sit down and talk with you about options for building new vs. buying an existing home. They specialize in both resales and new construction and unlike just dropping in a new construction community, they can tell you the pros and cons of each neighborhood and that particular building process. They know the right questions to ask and the right places to take you based on your wants and needs. For info on Waterside or any other real estate need please don’t hesitate to call, text or email Team Cashi.